Over the last few years I have had the honor of meeting so many Creative Entrepreneurs that desire to soar to higher levels in their business endeavors and their personal lives but don't have a written plan on how to do it! They have talent, skills, and awesome ideas but like other "Creatives" the thought of cleaning the fridge sounds like more fun than writing a boring business plan ! Wisdom says, "Failing to plan is actually planning to fail". After reading Jennifer Lee's book the Right Brain Business Plan I created my first business plan and realized it can be FUN and profitable. All my clients say they especially love creating their Vision Board Collage and using the playsheets to write down their goals and dreams and passions and watch it unfold in the universe right before their eyes. I became a Licensed RBBP Facilitator and to offer workshops for other Creatives to do the same! 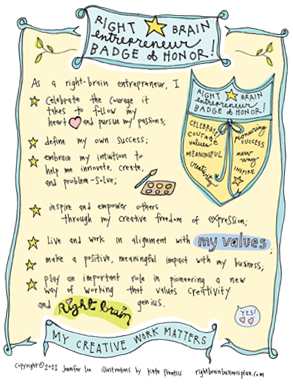 Earn a Right Brain entrepreneur Badge of Honor and attend a fun Right Brain Business Plan Workshop this month! you don't have a business plan? Do you know where your creative business is headed in 2017 and beyond? Want a fun and creative way to plan for your amazing entrepreneurial success? Then come join the party at the next Right Brain Business Plan® workshop! You’ll craft a visual plan that let’s your head know where your business is going and inspires your heart, too.